It’s never an easy task rebuilding old engines, especially when they’ve been obsolete for 30 years with the added complication of being of American origin. However in my humble opinion, an Allard should have a Cadillac engine, and as Jackie’s K-Type developed incontinence this winter, in its extremely loose flathead, and I had a similarly afflicted Caddy 331 lying around it seemed madness not to join the twain together, especially as the total rebuild of either engine would cost pretty much the same. That’s my excuse anyway! First job was to get the 23 inches of cracks, both internal and external repaired. This was carried out by Metalok who cold casting repaired the block to the point where you can just see the stitching. Having already acquired a set of 365 Caddy pistons the block was bored the necessary 3/16 inch oversize and Ford 351 rings fitted. The crank and rods were the next problem. The rods were twisted in all directions as well as the big-end eyes being out of round. The crank was already .030 undersize on the big-end journals, and Caddy .040 under bearings not being available, BLMC 2.2 litre diesel items (2 sets) were acquired. These are about .040 inch greater in diameter than the Caddy item and the rods were re-worked to allow for this. Also, .010 has to come off the side of the bearings due to their greater width, and a small notch filed in to match the rod/cylinder feed hole. The rods were also re-notched for the bearing tabs which are to be in a different position. The crank was then re-ground to the BLMC relevant undersize, which is virtually identical to the Caddy to all intents, but the bearings are available up to .080 under. Everything was then balanced. ’55 heads were to be used (a) because of their greater valve area and (b) their greater exhaust port size. Those on the 49/50 heads are miniscule. Before fitting the heads they were placed on the block deck and using a scribe from the bottom of the bores each cylinder was outlined to each chamber. The chambers were then ground away to remove the resultant overlap from the over-boring operation and their capacities equalized using a burette. The heads themselves were not skimmed as, in the future it seems, we are all to be treated to lead free fuel. 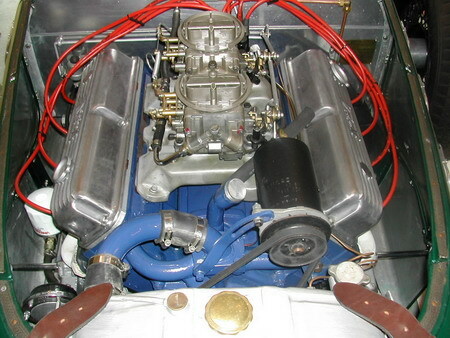 The engine was then built using an Isky solid lifter camshaft and 2 X 2661 Carters on a Detroit manifold. With the engine installed and the exhaust manifolds made the engine fired up the first time. Initial tests proved the scintilla mag to be unreliable, and this was replaced by a distributor. It was also discovered that the valve rockers were lifting the valve covers off the heads, so the covers were dimpled with a large ballpeen hammer to give clearance! After 600 miles the engine runs well but the Carters, of 13/16 choke size, as well as being on the small size, only appear to be like running in a straight line. Rather like an Allard really! I think those will be replaced by a four-barrel set-up very soon. For those contemplating this swap you will require the following: - (1) Caddy engine/Ford gearbox adapter plate (2) Caddy manual flywheel adapted for Ford spigot shaft (3) engine mountings (will have to be made) (4) exhaust manifolds tailor made (the original items will not clear the steering box) (5) Dynamo mounts for siting same between left hand head and oil filler pipe. (6) Brackets for the engine bellhousing to accept the tie rods (absolutely essential for smooth take offs) (7) Percy Vearance. How nice to hear from you! Yes, I have no problems with you re-printing the article. I would say that, nowadays, the situation has completely turned around. With eBay providing a market place for the old speed equipment - not to mention the fact that unlimited supplies of engine rebuild kits are available at the press of a button. Also the discovery that, no matter how bad your rod journals may be worn on your Caddy, forged big block Chevy rods are cheap and easily available. They start with a standard journal diameter .050 smaller than the Cad, and can extend the life of your crank for many thousands of miles. Regarding the engine that I originally rebuilt in the article, I still have it. I did do a lot of road miles and a lot of race meetings without the slightest trouble. In fact I freshened it up last year with some NOS Austin FX4 diesel bearings and a set of rings, and it's now my spare. It's worth noting that the early 331 rod journals are wider than the later items, which share the same dimensions as the 365/390/429. It's the later cranks that share a common rod journal width as the BLMC. Keep up the good work. I check in to the Register website at lease twice a week and there's always something of interest!